The countdown had been on for quite a while. The anticipation grew with each passing day. My daughter could hardly wait any longer for (no, not Christmas) me to be the "Guest Reader" in her first grade classroom. At Parent Night, before the first day of school, a sign-up sheet circulated the room for parents to volunteer to read aloud books to the class. I chose December 16th because I recalled quite a few great author birthdays around that date -- William Joyce (Dec. 11), Eve Bunting (Dec. 19), and Jarrett Krosoczka (Dec. 22). I figured it would be easy to come up with a few books to read. But then, the pressure started to build with my daughter's persistent excitement. Then, her teacher wondered if my guest reading could kick off their Jarrett Krosoczka Reading Experience. I questioned whether I would meet the high expectations. I prepared for my visit much like I would have planned for a lesson as a teacher. This preparation put me at ease. I was ready to rock or I guess... punk rock! I started with a little introduction about Jarrett Krosoczka -- the author and illustrator. We viewed a few of his "Book Talks" videos on Studio JJK website. Then, I placed his books Punk Farm and Punk Farm On Tour on the chalkboard ledge. 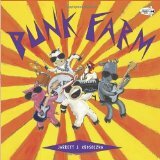 I wasn't sure all the kids had prior knowledge of punk music so we listened to the MP3 of Punk Farm from the website and talked about the different instruments needed to form a punk rock band. At this point, the lesson was pretty simple. The children were having fun, but I needed to kick things up a notch. So, I pulled out a bag that I had brought and told the kids that I couldn't read the Punk Farm books dressed the way I was. I needed to be dressed like.... a punk rock star! I pulled out a silver studded belt, a fancy jacket, a pink tie, multiple pairs of glasses, and some bling. My outfit was almost complete when I asked the kids, "What is the coolest thing about punk rock stars?" The first student said, "Their hair!" I said, "Absolutely," and pulled out a container of hair gel and gave myself my first ever mohawk! All the theatrics worked. They kids were dialed in and focused. I read both Punk Farm books aloud and we yelled the lyrics of the songs by Punk Farm into the pretend microphone. It was a blast. However, the best part about the whole experience was that my wife informed me later in the evening that my daughter told her grandmother, "Today was the best day ever, Grandma! My dad was a guest reader in my class!" I guess I lived up to the hype! The students in my daughter's class will be spending the last few days before the holiday break doing many of the activities in the Jarrett Krosoczka Reading Experience packet. All the activities were designed with the intent of engaging students in higher level thinking. Additionally, I was very pleased that Jarrett Krosoczka supported the Experience, repackaged it, and made a few additions. The new and improved JJK Reading Experience is available on his website. It includes activities for all of Jarrett's books along with the corresponding worksheets! ALL FOR FREE! Check it out! Peace Out, Wisconsin! Peace Out, Colorado! Great blog and you're a GREAT DAD! Thank you so much GMR and Sandra! I appreciate that you stopped by the blog!